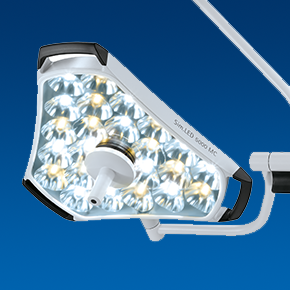 SIMEON HighLine surgical lights deliver the benefits of cutting edge LED technology. Patented Sim.POD modules generate a large light emitting surface with a uniform beam of light. This bundling and overlapping of light rays creates ideal illumination in any situation. SIMEON innovation is not limited to the LED technology; lighting controls are intuitive, painted surfaces are anti-bacterial (reduces germs by > 99.999%). The aluminum housing resists impact damage while improving LED heat transfer. A glass face retains optical clarity under repeated exposure to harsh cleaners. Lights are available in single or multi-color versions. 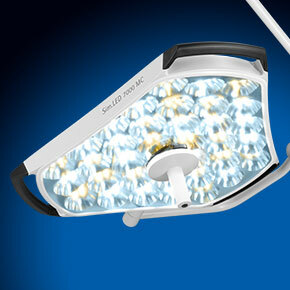 The triangular design allows two light heads to nest side-by-side, providing a single large light field over the patient.